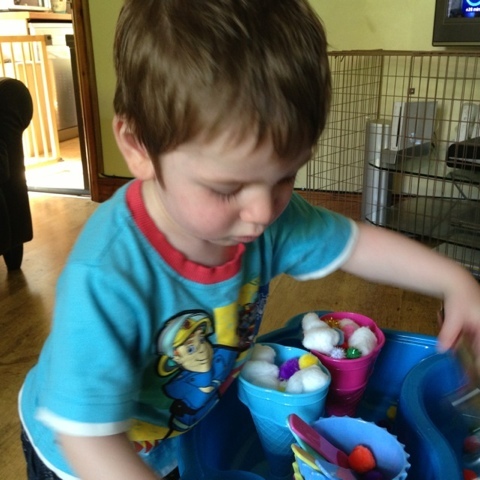 We are really making the most of our sensory table, I've been trying to think of things around the house that I can mix in with items from our play box rather than buying new things to play with. 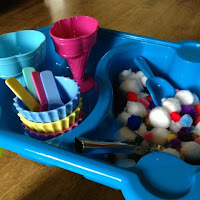 When I emptied the pom-poms into the tray, T took some new ice cream dishes from the kitchen counter and started filling them up! I thought that ice cream sundaes would be a great idea for a sensory box and so added some cotton wool balls as there weren't enough pom-pom's to fill the bowls, I also gave him some ice cream cone plastic glasses that I had in the cupboard and an ice cream scoop. 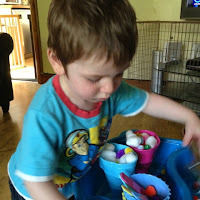 T had a great time scooping up and making sundaes. We kept this sensory tray going all weekend, T made sundaes for us all, he even got the hang of pretending to eat the 'ice cream' rather than filling his mouth with pom-pom's and cotton wool and spitting it out!!! NOTE: I never leave T unattended during our sensory play time as I often use things that he could put in his mouth, I am lucky that he rarely does this. On this occasion he only did it because he copied me and didn't understand pretend eating. I'm pleased to say that he's now got the hang of pretending to eat. 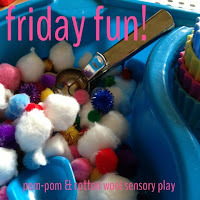 Do you use cotton wool in sensory play? 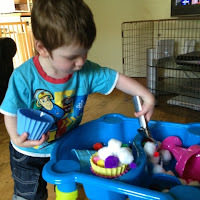 I'd love to get more ideas of how we can use it for future sensory trays. This is ace Leandra! Love love love!!!! Lovely idea and no mucky mess. Looks like lots of fun was had a such a simple wonderful concept. Definitely want to try this. Also love the tray.